I've just returned from a visit with Dr. Miller, my Kaiser dermatologist. He froze the squamous cell carcinoma that was found on my left neck a while back. Dr. Miller also examined my head and torso for suspicious growths and froze about 10 of those! I have an appointment to return next February for Dr. Miller to take a look to see if the squamous cell carcinoma returned. Reader Lou Schneider commented that Box Van's hitch ball may be the wrong size causing the 2-unfortunate incidents of yesterday when Scampy unhitched! I measured the hitch ball that I had been using and also Box Van's hitch ball. Both are the same size. I am going to purchase a hitch ball lock to prevent Scampy from unhitching again. I went to RV Trailer Supply to purchase the hitch ball lock that I Blogged about in my 8:47 am post. The guy in the shop told me that what I should do instead is buy a 2" Coupler Repair Kit. Which I did. 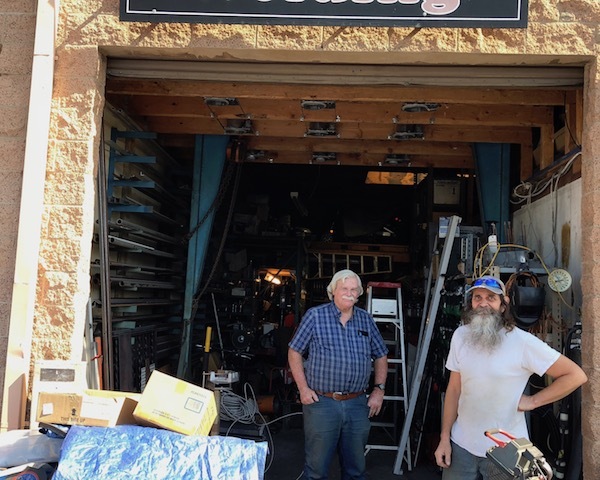 After phoning several welding shops near me, I chose Santee Welding. Mike [the owner] sounded friendly and knowledgeable! Mike made a proposal with a drawing of how he would mount the new propane tank. I accepted what he planned to do. The job will be done this coming Monday! 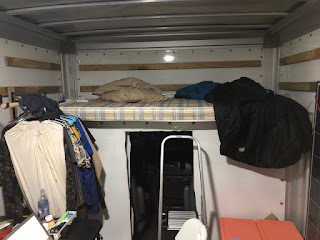 As of yesterday, I am fulltiming in Box Van! Below is my Nite Camp location. I am completely stealth camped. Several of my neighbors are within ear-shot of me and chatting away. None of them are paying any attention at all to Box Van, who is the interloper in their neighborhood! However, Box Van is not perceived as an interloper. Because of Box Van being a used-to-be U-Haul truck! Never in all of my years as a stealthy nite camper, have I ever dared to make a camp like this one! "I am going to purchase a hitch ball lock to prevent Scampy from unhitching again." A nut and bolt through the hitch latch works just as well. It appears as though tongue's hitch mechanism is messed up! I bought a replacement. Looks like an easy install. Hey George—did I miss something?? I thought Scampy was staying at Mimi’s house until she is sold. Why are you towing her around with Ms Box Van? It appears that you may have missed perhaps the most exciting time in my whole life!! Go back in my Blog to where I purchase a truck from U-Haul. Then read all of my Blog posts to the present day. George, chartrue2 is referring to the blog statement on Oct 15 @ 7:38...…..
➜ John and Mimi gave their permission to camp with Scampy in the street in front of their home. Also, to connect Scampy to their 120-volt AC shore power. "Unless there is an overwhelming reason, I will not be towing Scampy anymore. She will remain camped at John and Mimi's home until a buyer comes along." Unless there is an overwhelming reason, I will not be towing Scampy anymore. She will remain camped at John and Mimi's home until a buyer comes along. PS—when we had our class C motor home, we loved sleeping in the cab over. Grandma’s attic reminds me of that and looks SO comfortable. I know you plan to build our your living area and wondered if you plan to insulate the attic? When we have tried sleeping in an uninsulated van, we were awakened by condensation from the metal ceiling dripping down on us and it was a rude awakening! I will likely insulate the attic's walls and ceiling. "Come on George if you don't tighten the nut under the trailer hitch that clamps the ball . you're just wasting your time". Lately, Ed, you have pulling stuff right out of the air and attributing this stuff to me! Then, other Readers pick up your made up comments and then your "lie" [Which let's face it is exactly what it is!] telescopes into a bunch of garbage that nearly every Reader believes is true! Readers don't comprehend that you make up this stuff out of whole cloth! If you keep on this path, my Dear Mister Ed, You will wind up in hell in a handbasket! Lighten up on Ed. He is just trying to help, after all, he is not the one that last lost his trailer TWICE. The next time it may kill someone. He is asking that you make sure the adjustment of the coupler "underjaw" is right. For the readers that might not know... When the "handle assembly is in the vertical and "open" position (picture has it horizonal and "closed" position), always the "underjaw" to slide pass the ball of the hitch and the coupler rests on the ball. When the handle assembly is lower to horizonal, The "underjaw" moves forward and up into position under the ball. The "fit" is adjusted by the "locknut". It can not be a "tight fit" but must to adequate to keep the "coupler" on the ball. The ball and coupler must be the same size, even a 1/4" makes it fail. Would you rather I had said George did you forget to lock the locking mechanism ??? There are actually two questions here the first one I don't need to pull stuff out of the air, if I haven't been there and done it I wouldn't blog to you about it, simple as that. If I make mistakes. have I not acknowledged it? Mr. George I know/think your readers by far are away lot smarter than you give them credit for. but it appears you Mr. George don't see that. I'm on the path to the Hand-basket,,, cool that's funny. As you say. What the hell is the ,,whole cloth,, ? When I hit the send button i'm only trying to do you the favor not me. I really do. I hope you succeed,, please believe me I do. The mines eye is a wonderful thing. If it just minimalistic that you're looking for. You can achieve it. Anything beyond that in all honesty.. i think you're Way over estimate your talent/ability. So prove me wrong old man. So feel free to delete it ..
i'm pretty sure you have read it and I have said my piece. George, in Mr Ed's defense, most hitches have a nut underneath that adjusts the tension of the latch mechanism on the ball. Just hitch up and try to lift the trailer off the ball with the tongue jack (or any other jack available). There is an easy to find reason why the Scampy comes off the ball. Ed does not need a defense. What he does need is to stop jumping to conclusions. In this case, Ed assumed that I did not have Scampy's coupler adjusted properly. He did not ask me. [ie; George, did you check if the coupler is properly adjusted?]. The first time you ran over the railroad tracks and you lost your trailer (I believe it was twice )what was the cause of it. Do you remember the schematics that I sent you and you corrected it. Your latest blog about losing the trailer (I believe it was twice )what was the cause of that. The picture I sent is the most common style coupler but not the only type. I yours is different post a picture of it, please with sugar on it. George, after doing a little research (sorry I can not remember every one of your posts even if I am a fateful reader from the start), on August 24, 2017 you installed a DURASAFE COUPLER CONNECT installed. What happened to it? George, I hope you can get thru this without hurrting yourself or anyone else. Mr.Ed and others know exactly what Ed is saying to be true. The hitch is not secured and must be to operate safely. Ps the hitch size is clearly on top of ball hitch or on one side or other. 15 months ago on July 27, 2017, you had the same problem. Please make sure this is fixed, this is no laughing matter. Why didn't your safety chains do their job? How about...stop hauling the Scamp around?! Publishing your camp location online is not what I would call 'Stealth Camping'. Love the little sleeping nook! How many times has your trailer become unhitched. Your a menace on the roads. Somebody’s going to get hurt with your incompetence. One last comment and I am done with the "uncoupling". If everything in hooked up right AND in proper working order this should not happen. When hooped up, scampy's tough rails should be level (or at least close), if they are up or down TOO much the jaws of the coupler will not seat properly and will bottom out on Box Vans hitch and literally force itself off the ball. When you lost Skampy on the street,has it occurred to you that you could have killed someone with the runaway trailer. ? After you get your propane tank mounted in the place of your choice ? Nice suggestion on the Gas Hose Mr. Ed.